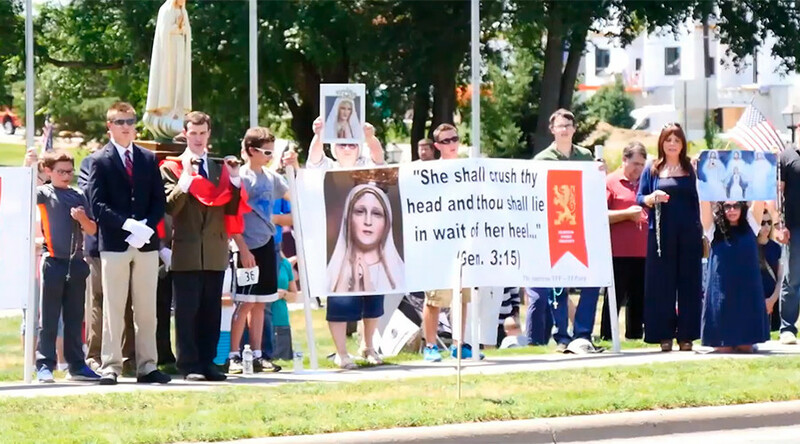 Hundreds of Catholic demonstrators have turned out to protest the planned installation of a satanic statue at a Minnesota memorial park. Saturday’s protest saw droves of protesters sing and pray while holding placards that read "Satan is evil, evil has no rights", “Honk against Satan” and "Satan takes souls to hell" at Veterans Memorial Park in Belle Plaine, southwest of Minneapolis. The protest comes after a religious freedom group pushed for the removal of a 2ft statue of a soldier, known to locals as ‘Joe’, kneeling in front of a cross. The site of the statue, which is meant to emphasise the divisions of church and state, was subsequently designated a ‘Free Speech Zone’ by the city council. However, following the designation, the Satanic Temple proposed erecting their own monument inside the zone. In an effort to dispel the controversy, the soldier and cross statue was removed from the park Friday. Lawmakers may vote to remove the ‘Free Speech Zone’ entirely Monday. Despite the protests, the Satanic Temple is still pushing ahead with its proposal to install its monument, a black cube inscribed with pentagrams and topped with an upside-down soldier’s helmet.